Students at the University of Illinois are asked to rate their instructors at the end of each semester using anonymous questionnaires provided and scored by the Center for Innovation in Teaching and Learning (CITL). Instructors are rated on their overall teaching effectiveness and the overall quality of their course. I have depicted my results for these two questions in the graphs below. I have also included selected written feedback from students at the bottom of the page. 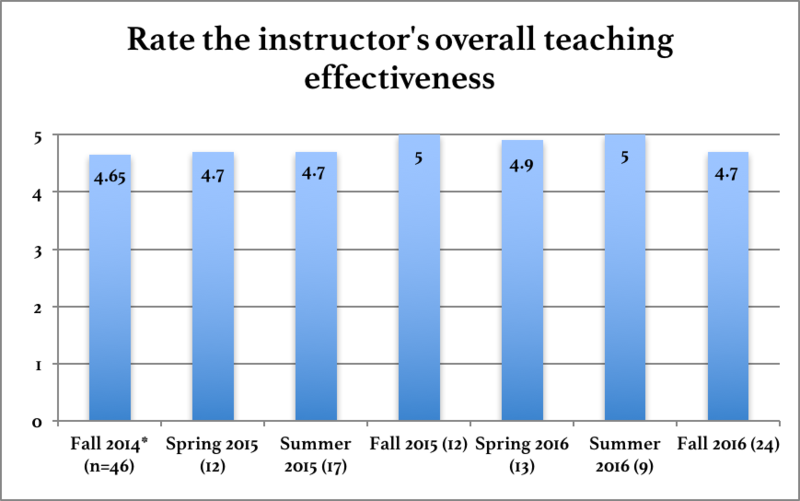 Instructors whose teaching effectiveness is rated above an average of 4.4/5 are included on the 'List of Teachers Ranked as Excellent' released by CITL each semester. I have earned a spot on this list each semester I have collected formal feedback, and, every semester since the Fall of 2015, I have been marked 'outstanding' by scoring in the top 10% of instructors at UIUC. Students from each of my courses rated my overall teaching effectiveness on a 5-point scale, with a score of 5 indicating "Exceptionally High" teaching effectiveness. Note for the Fall 2014* semester that I have averaged the responses of two sections of Introduction to Psychology (PSYC 100) into one score. Click here for courses I've taught each semester. 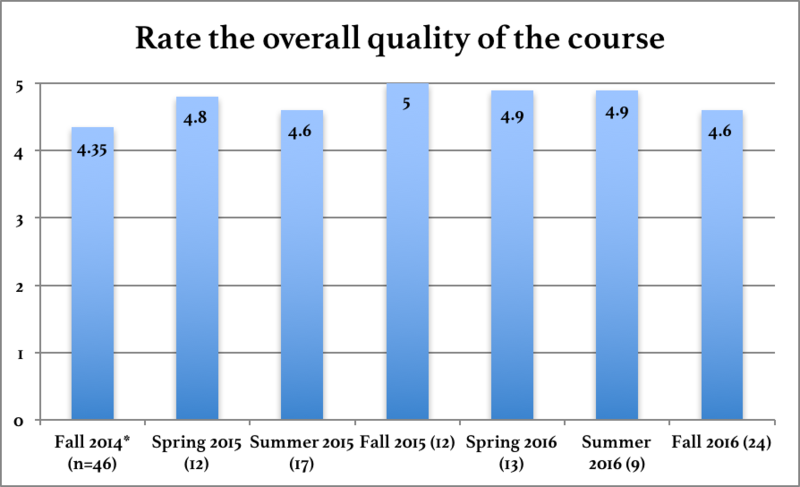 Students rated the overall quality of my courses. Again, a score of 5 indicates an "Exceptionally High" quality course. I averaged two sections of Introduction to Psychology (PSYC 100) together to create the Fall 2014 column. The scores from Spring 2015 through Fall 2015 are particularly important to me, as I had more freedom to design the content and progression of those courses than I did when teaching PSYC 100 in Fall 2014. Below you will find some quotes from students written comments on course feedback forms and from student emails. ​"I love her teaching. She's very bubbly and interesting to listen to. I love how she always is so happy to see us and is more than happy to help us." "She cared about her students and clearly put in a ton of hard work. Thank you!" "Really nice, always available to students, good role model"
"This is the dopest class I ever took." " I thought psych was boring in high school but you've made it fun!" ​"Very nice and caring, fair grader, great at explaining the material." "I really enjoyed being in your class this summer and was thankful to have learned so much from you."